Dusk till dawn, we’re haunted by stereotypes and taboos surrounding menstruation that force us to think, question and act. Appalled by the ignorance and on a quest to drive women towards more healthy and sustainable menstruation practices, we at Muskurahat Foundation along with Muse launched an unconventional and exclusive festival – Masika Mahotsav. Celebrated on the World Menstrual Hygiene Day on May 28th, the festival was in collaboration with Rotaract Club and Kishanchand Chellaram College, Mumbai. In a country, where women bleed every month, are inflicted with unbearable pain every month and are yet forbidden to talk about their bleeding and pain – Masika Mohatsav was a ray of hope. 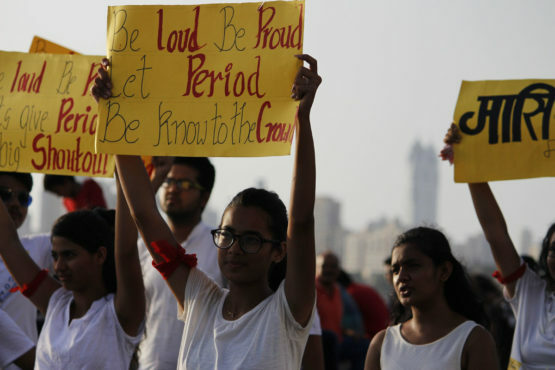 Through marches, art programmes and so much more, we aimed to not only raise awareness about the subject in general but also hoped that people can talk about ‘periods’ and use the words ‘menstruation’ without any guilt, shame or fear. The whole point of Masika Mohatsav, was thus to normalize the conversation surrounding periods and menstruation – to make these words common, usable and thereby accepting them as a part of the society. Masika Mohatsav was a blend of two events – a Chalk Art programme and a Back-A-Thon – both unique and extremely unconventional in their message and approach. An enthralling support from the city has definitely inspired us to initiate more efforts in the direction of ‘Sustainable Menstruation’. Our aim behind Masika Mahotsav was to break, push behind the prevalent stereotypes surrounding periods and menstruation as a process. Back–A–Thon, as a rally was aimed at pushing ‘back’ stereotypes in an attempt to construct a more progressive and open-minded society. Participants carried banners with inspiring words and echoes slogans throughout the rally – all in an attempt to craft a better society. The rally began from Hotel Intercontinental and went all the way to Hindu Gymkhana (Marine Drive).